The Future of Family Medicine Report envisioned a new model of practice “committed to providing the full basket of clinical services offered by Family Medicine.”1 In actuality, variation in that basket is considerable and may influence patients' access to care as much as supply and distribution of physicians does in the wake of health care reform. When applying for Part III of Maintenance of Certification (cognitive examination), all family physicians must identify areas of practice on a mandatory (100% response rate) questionnaire included in the online application. We analyzed 3 years of responses (2006–2008) to assess what percentage of family physicians reported any service delivery across service type, all of which fall within the realm of family physician training. Specifically, we used data from a cohort applying for the Part III examination during the years 2006 to 2008 (n=26,355). Variation in services provided is considerable, and less than 40% of family physicians reported offering any services in more than half of the areas of scope considered (Figure 1). Percent of family physicians offering various services. To preserve access to services already deficient in rural and urban underserved areas, policymakers will need to consider not only workforce supply, distribution, and composition but also desirable scope of practice. Specifically, they will need to adapt policies that influence provider scope of practice to allow visions of comprehensive care within a patient-centered medical home for all Americans to be realized. These include, but are not limited to, provider payment, certification and credentialing, and undergraduate, graduate, and continuing education. Funding: Funding was provided by the American Board of Family Medicine, which contracts annually for health policy/health services research conducted by the Robert Graham Center for Policy Studies related Maintenance of Certification and Quality.
. The Future of Family Medicine: a collaborative project of the family medicine community. Ann Fam Med 2004;2(Suppl 1):S3–32. , eds. Primary care: America's health in a new era. Washington, D.C., National Academy Press, 1996.
. Declining trends in the provision of prenatal care visits by family physicians. Ann Fam Med 2009;7(2):128–33.
. The physician workforce in the United States: a family medicine perspective. 2004. Available at: www.graham-center.org/PreBuilt/physician_workforce.pdf. Accessed 25 September 2011. You are going to email the following What Services Do Family Physicians Provide in a Time of Primary Care Transition? 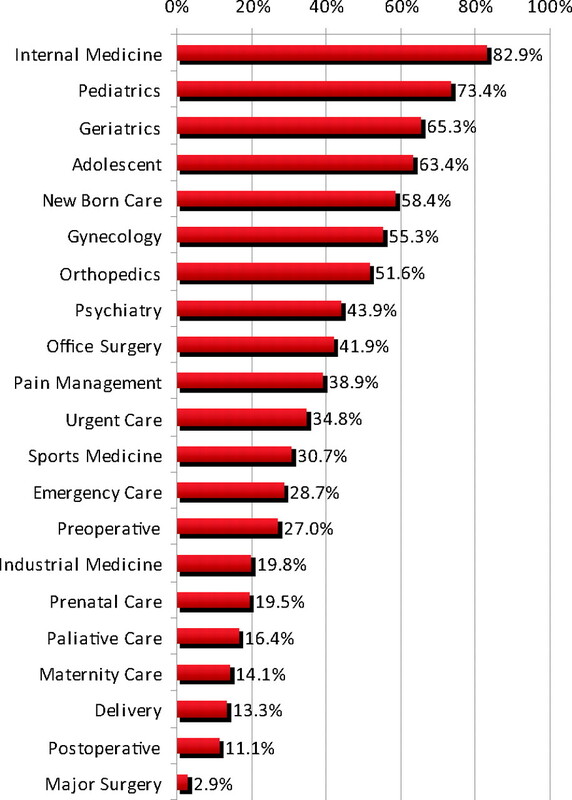 Family Physician Geriatricians Do Mostly Geriatric Care: Is This a Problem for Our Specialty?